Presented by ChevonMedia & Plane Jane Records. The fundraiser was a success with a packed house, gift bags, raffles and great music. Then, as another year went by, some things changed. The hospitalizations of Erick Sermon, Rick Ross and Lil Wayne; the passing of Heavy D and the heart attack that her friend DJ Statik Selektah suffered on tour pushed Chevon to search for additional knowledge about how food affects our bodies. She read about healthy meals, shared recipes with her networks and held online chats about making strides in eating better. Her following grew to include people like Big Daddy Kane, who calls her from the road for healthy eating tips. But when Chevon met an urban food advocate whose organization runs healthy food programs in Brownsville – another charity event was born. 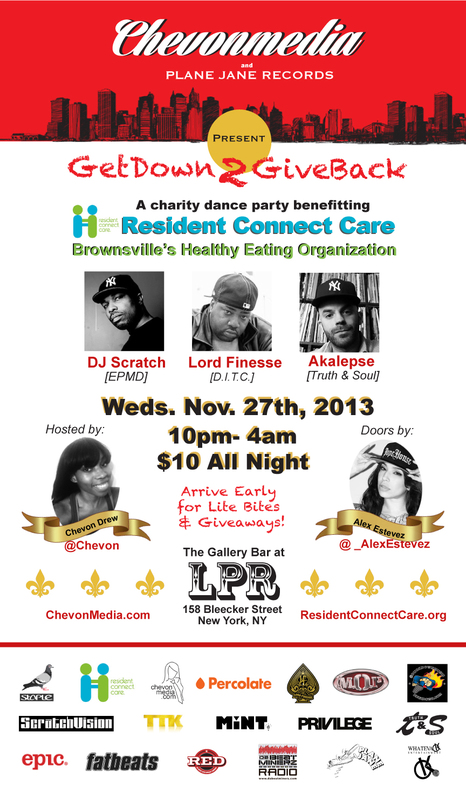 This holiday, Akalepse and Chevon are teaming up to bring the second ‘Get Down 2 Give Back’ charitable dance party to life. The inimitable DJ Scratch of EPMD and the legendary Lord Finesse will join Akalepse on the turntables at LPR to raise funds for resident. connect. care.’s Brownsville’s healthy eating organization. resident. connect. care. is a grassroots organization committed to serving clients that live in food deserts and experience overwhelming diet-related morbidity and mortality. They currently serve the public housing community of Brownsville, Brooklyn and work in partnership with the Fund for the City of New York. Their mission is to help people who live in food deserts reduce the effects of preventable illnesses like diabetes, hypertension and heart disease – through after school cooking programs and food justice advocacy. resident. connect. care. maintains a website plus Facebook and Twitter accounts and is a verifiable nonprofit organization. Their nonprofit credentials are in partnership with The Fund For The City Of New York are available here. Tweet the event now! Just Copy & Paste on Twitter.